At the AMA convention in Atlantic City in June 1947, the American Academy of General Practice was born and Dr. George Marchmont-Robinson of Illinois was appointed to the original board of directors. Although chartered in Illinois, AAGP soon relocated to Kansas City, Missouri. Dr. Marchmont-Robinson then organized the Illinois Chapter of the American Academy and appointed the original officers and directors who served a year before the Illinois Constitution and bylaws were ratified at the first meeting in Springfield in 1948. Beginning in 2006, the academies of pediatrics and family medicine loudly and proudly advocated for the efficiencies and outcomes of patient-centered medical homes. Illinois’ Medicaid program launched Illinois Health Connect, to link all Medicaid patients with a registered primary care medical home to serve as the ongoing point of regular care. The first medical directors of this program were IAFP leaders Margaret Kirkegaard, MD (2006-2013) followed by Alvia Siddiqi, MD (2013-2015). Also at that time, Medicaid launched a disease management program, called Your Healthcare Plus, which provided extra support for Medicaid patients battling chronic illnesses. The goal was to keep these people healthier through regular primary care, keeping them out of the ER and hospital. Participating providers were paid a bonus to manage these more complex patients. IAFP past president Fredric (Rick) Leary, MD was the first director of Your Healthcare Plus, followed by another past president, Carrie E. Nelson, MD. In 2015, Illinois moved to a managed care organization model, moving over half of Medicaid patients into mandatory managed care organizations. Only patients who lived in areas not served by an MCO were still managed by Illinois Health Connect. Members of IAFP served on the Illinois State Board of Health to help shape the State Health Improvement Plan and provide input towards health policy during the years 2003 to 2015. Javette C. Orgain, MD, MPH served as the chair from 2004-2015. IAFP leaders Tim Vega, MD; Carolyn Lopez, MD; Jerry Kruse, MD, MSPH and Margaret Kirkegaard, MD, MPH provided family physician voice and guidance to the board. Meanwhile, family medicine steered the course in Chicago, as Dr. Lopez chaired the Chicago Board of Public Health from 2008 to the present and the Institute of Medicine of Chicago from 2005-2007. IAFP and other health groups remained steadfastly dedicated to tobacco issues, including clean indoor air. Local ordinances passed in many cities, most of which included IAFP members as lead organizers and spokespersons to advocate for comprehensive clean indoor air laws covering all workplaces, including bars, restaurants and casinos. Local ordinances passed in Evanston, Oak Park, Glenview, Naperville, Carbondale, Arlington Heights, Bloomington and others. These local ordinances helped fuel the statewide push and in 2007, the Illinois General Assembly approved the Smoke-Free Illinois Act, which took effect January 1, 2008. At the IAFP annual meeting in 2007, while celebrating our 60th anniversary, IAFP president Patrick Tranmer, MD gave his President’s Awards to the three legislators who led the charge: Sen. Terry Link, Senate President John Cullerton and Rep. Karen Yarbrough. History was made in 2008 when the United States elected the first African American president, Barack Obama of Chicago. That same year, IAFP inaugurated its first African American female president, Javette C. Orgain, MD, MPH of Chicago. Many within IAFP leadership were excited, as the Academy had often worked with Illinois Senator Barack Obama on health care legislation in the Illinois General Assembly. In fact, when IAFP convened its first ever Spring into Action lobby day in (2003), our opening speaker was state senator Obama. Obama was elected to the U.S. Senate in 2004. IAFP continued to maintain a relationship with Sen. Obama through the AAFP Family Medicine Congressional Conference and Constituent Coffees. Obama took the access to health care message central to family medicine with him to Washington. The Patient Protection and Affordable Care Act, also known as ObamaCare, passed in March 2010 and was immediately signed into law. Full implementation of the Act would take three years to complete. In Illinois, that included expanded Medicaid eligibility and a state-federal partnership in developing and launching a web-based marketplace for those who do not receive employer based insurance to find and purchase approved health care insurance policies. Community/outpatient-based primary care residency training is crucial for taking training out of the hospital and into the communities where physician-led practices can best meet the needs of their patients. A pilot program called Teaching Health Centers - established by the Patient Protection and Affordable Care Act in 2010, funded 59 primary care residency programs in community health centers, including the Northwestern McGaw Family Medicine Residency at Erie Family Health Center in Chicago’s Humboldt Park neighborhood. These programs trained physicians in settings to directly address the complex needs of underserved communities, to best prepare them to practice in such underserved communities after residency. The premise delivered on their projections. Since the program’s inception, 55 percent of graduates practice in underserved communities, more than twice the average of traditional GME programs. Created in 2010, IAH provides home-based primary care to high-need Medicare beneficiaries with multiple chronic conditions, helping them to avoid unnecessary hospitalizations, emergency room visits, and nursing home admission. IAFP member Thomas Cornwell, MD, whose practice was dedicated to home visits, worked with his Congressman, U.S. Rep. Peter Roskam to draft and pass this legislation which document the savings of home care and advance the model. IAFP embraced healthcare transformation in 2010 by hosting a Patient Centered Medical Home (PCMH) Conference, an outgrowth of earlier IAFP conferences on Electronic Health Records. At that time, more that 60% of members were owners or partial owners of their practices. The Practice Improvement Network (PIN) was launched in 2011 to provide PCMH coaches to these members. About 20 practices participated in the project which ended in 2015. While some of these practices transformed significantly, a trend towards employed practice diminished the expected reach of the PIN. In 2011 Javette C. Orgain, MD, MPH of Chicago was elected AAFP Vice Speaker, re-elected for a total of four terms, and then elected two terms as Speaker in 2015 and 2016. During her time on the AAFP board of directors, the Illinois chapter had two other members who served with her on the board. In 2012-13, Ravi Grivois-Shah, MD, MPH served as the New Physician Board member, and Lauren Abdul-Majeed, MD served as the Student Board member at AAFP from 2016-17. In 2015 IAFP past president Ellen Brull, MD was appointed to the AAFP FamMedPAC board of directors. Of the 41 attendees from FM Midwest 2012 who graduated in 2013, 39 matched into family medicine residency programs. Of 61 FMM Midwest attendees in the 2014 Match, 42 are in family medicine residency programs. Of 72 FM Midwest attendees in the 2015 Match 43 are in family medicine (60%) and 31 of them are in Midwest programs. 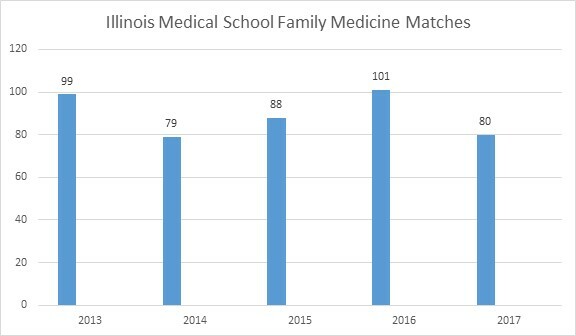 50 of 78 graduates who attended any of the first four Family Medicine Midwest Conferences matched into Family Medicine in 2016. Thirty of them are staying in the Midwest. Of 54 conference attendees in the 2017 Match, 31 matched into family medicine and 25 of them to Midwest residency programs. Illinois experienced a somewhat inconsistent number of Illinois students choosing family medicine. Unfortunately, for Illinois, typically at least ⅔ of those who matched into family medicine chose programs outside of Illinois. The electronic health record (EHR) began as an innovation, evolved to a requirement, and continues to be a mandatory key factor in health care over the past decade. Unfortunately, the EHR transition has been rocky at best, with interoperability problems and implementation that seems more geared to help payers than the provider or the patient. The UGLY - Crashes, security risks and breaches, slow-downs, barriers in the exam room, burden of check-box medicine, frustration, take home work and a lack of integration that keeps EHRs from realizing the true potential of portability and managing patient care across different health care interactions. AAFP has been a leader in enabling family physicians to use Electronic Health Records. They continued to raise the urgent call that physicians are burdened by the inefficiencies caused by making family physicians work more as medical data entry clerks. A 2013 study of emergency room physicians showed that they averaged 4,000 clicks per 10-hour shift. Another time-motion study of family physicians and internists found that nearly 50% of each day is spent on EHRs and desk work. “Whacking the WAC” (Work After Clinic) is a call from AAFP and IAFP to simplify the processes and procedures in practice, putting the doctor and patient relationship first in the exam room. Death of the SGR - at last! The physician community nationwide sustained 17 years of repeatedly lobbying Congress to prevent Medicare physician payment cuts triggered by a 1997 Balanced Budget Act Sustainable Growth Rate Formula. In 2015, the SGR was replaced by an enormous compromise bill called the Medicare and CHIP Reauthorization Act (MACRA) which would eliminate the SGR and move physicians into one of two payment models – Merit-based Incentive Payment System (MIPS) or Alternative Payment Models (APM). AAFP launched into the next phase of Future of Family Medicine 2.0 in 2013. 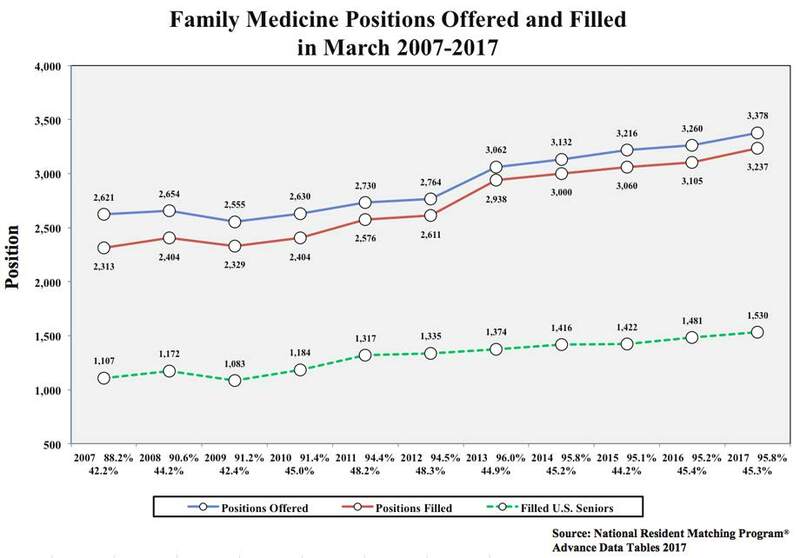 Based on the Future of Family Medicine 1.0 project, 2003-2004, the project, titled ‘Family Medicine for America’s Health’, joined all eight family medicine organizations to promote family medicine and set its course for the next 10 years. Its ambitious goal, “Strengthen family medicine and primary care to ensure that we can meet the nation’s health care needs, and ultimately, improve the health of every American,” was operationalized in 2014, Family Medicine for America’s Health is the public-facing portion devoted to proclaiming the evidence-based precepts of primary care/family medicine. As part of its first two years, tours were hosted in six cities, including Chicago in 2015. At this public event Illinois family medicine was showcased with two all-star panels http://www.iafp.com/health-is-primary ; followed with a special evening edition for student and resident members at University of Illinois at Chicago. While the public relations campaigns were particularly focused on health policy makers and federal legislators, the “Health Is Primary” theme made its way into general publications through targeted placement of ads. The evaluations were solidly favorable towards primary care and family medicine by those who saw the ads. The limited advertising funds worked well. The longer-term effect of Health Is Primary will be felt from the six workgroups formed to develop ideas for family medicine in the 2020’s. For example, featuring innovators in family medicine (such as Illinois AFP member Thomas Cornwell, MD, whose career in providing at-home care to bedridden patients catapulted into the development of the Home Centered Care Institute, www.hccinstitute.org ) inspires other family physicians and helps to shorten the time frame of innovation transfer. Other workgroups developed tools for practices to move towards value-based payment, to assist solo and small group practices to participate in the MACRA payment era. 2013 IAFP introduced the new tagline Devoted to Advocacy Education and Action as part of a rebranding effort to crystalize what makes IAFP a unique membership association. These words became the structure of all IAFP activities and reporting. Advocacy at all levels through regular communication with lawmakers. IAFP launched the Spring into Action concept in 2003, then expanded it in 2009, providing three consecutive days in Springfield educating IAFP members then connecting them with their state lawmakers on issues of physician and patient importance. This proved to be a popular training experience for resident and student members beginning in 2013. As the event grew in popularity 2017 proved to be the largest Spring into Action yet, attracting 97 members over three days. After earning ACCME accreditation in 2010, IAFP expanded and diversified its continuing medical education offerings. After years of live events and printed enduring materials, IAFP took CME to the internet, in both live webinars and recorded modules. This move gave IAFP the opportunity to create and disseminate more education topics and reach wider audiences. Meanwhile IAFP members now had the ability to earn their CME at a time and place convenient to them. IAFP offers clinical, practice management, advocacy and hot topic education through a learning management system. Beginning in 2014, IAFP partnered with Essential Evidence, through UIC Dept. of Family Medicine department head John Hickner, MD to host an annual 2-day summit of rapid-fire CME at UIC to ensure members stay up-to-date on the immense variety of clinical topics in their scope of practice. Essential Evidence was expanded to Springfield in 2016 and will continue in 2018. Partnering with National Procedures Institute, SIU Department of Family and Community Medicine and IAFP hosted a one day Point of Care Ultrasound workshop in 2017. Education became more than pre- and post-tests. It’s now a demonstration of continuous learning, adapting and implementing new methods of delivering better care in effective, high-functioning, team-based practices. In fact, the AAFP has recently embarked on an initiative to modernize its credit system to better serve members. The intent is to maintain its relevance by harmonizing requirements with other professional expectations -- such as re-licensure, maintenance of certification and payers' quality improvement requirements -- to engage in lifelong learning and show practice performance. Action Launch of a new www.iafp.com. The Illinois Academy re-committed to building our membership, increasing engagement of our current members across the career spectrum and the geographic map. We set an organization goal to engage our new-to-practice (or early career) members and serve them through their journey from residency, to that first job, to committed active IAFP member for their career. This new platform finally enabled our Academy to combine our membership data, email communication, event registration and keep an updated integrated mobile-friendly website to serve our members. This major transition took time, and certainly produced a few hiccups and obstacles along the say. The headaches of transition were worth it, as this new system enabled IAFP to be more targeted e-mail communication, as well as a new appreciation by IAFP staff of the strain electronic health records implementation put on our members. Meanwhile, IAFP entered the social media revolution with the establishment of Twitter handles for IAFP and the Family Medicine Midwest Foundation, as well as Facebook pages for both. Likewise, some IAFP leaders and members used these same social media platforms for personal advocacy, or to amplify Academy advocacy messages within their own communities. 2016 proved to be a pivotal year for women family physician leaders. Inspired by this momentum, IAFP launched the Women in Leadership interest group in 2016, uniting IAFP women members across the constituencies for collaboration at live events and individual relationship building. Vincent D. Keenan, CAE celebrated 25 years as the Illinois AFP chapter executive in 2014, with a series of celebrations throughout the year, and a year-long Foundation fundraising campaign, which raised $13,775 split evenly between the Family Health Foundation of Illinois and the AAFP Foundation. 11 years of Chicago White Sox games - where IAFP members and their fellow baseball fans gather for one night of baseball to root for the Sox and raise money for the Foundation. IAFP has administered a Tar Wars program since 1999. Though the AAFP still owns and operates the Tar Wars program, the national poster contest was phased out in 2014. The IAFP Foundation continues to hold an annual state poster contest and honor the winner at his or her school with a cash prize and a grant for the school. The foundation continues to provide leadership activities and support for students and residents to attend IAFP and AAFP events. Your Academy at age 70 in 2017– Anywhere at any time! Under the guidance of the Building Task Force, the IAFP sold the headquarters building at 4756 Main St. Lisle in November 2015 and closed in March of 2016, ending the office-based Academy. All eight Academy employees are virtual, connected by computers, regular staff meetings, conference calls and webinars. This move also freed employees to spend more time “in the field,” connecting with leadership, members, partner organizations and learning opportunities. In 2017 the eight staff members of the IAFP have a combined 138 years of service to IAFP, ranging from 5 years to 28 years. Together with a growing membership of over 4,700 we proudly and joyfully celebrate 70 years of the Illinois Academy of Family Physicians. This update to IAFP’s history was written by IAFP Vice President of Communications Ginnie Flynn and Executive Vice President Vincent D. Keenan, CAE. IAFP thanks the following long-time leaders for their review and input to shape and recount IAFP’s past ten years: Janet Albers, MD, FAAFP; David J. Hagan, MD, CPE, FAAFP; Kristin D. Drynan, MD, FAAFP; Katie Miller, MD, FAAFP; Javette C. Orgain, MD, MPH, FAAFP and James Valek, MD, FAAFP.